Proc. Calif. Acad. Sci., Ser. 3, Bot. 1: 264. 1899. Ascocarp hypogeous, 10-20 mm broad, compressed globose, occasionally shallowly lobed, typically with an apical fold or cavity; mycelial debris sometimes adhering to the base; peridium orange brown to reddish brown, covered with short, pointed pyramidal warts; gleba solid, marbled greyish white, interspersed with whitish veins or canals radiating from the apical region; odor and taste not distinctive. Spores 20-26 x 11-13.5 microns, ellipsoid, smooth, thin-walled, hyaline, usually with three oil droplets; asci ellipsoid to fusoid-ellipsoid, thin-walled, 50-75 x 25-40 microns, scattered in the gleba, not in a palisade. Solitary to scattered under conifers and hardwoods, e.g. pines (Pinus spp. ), firs (Abies spp. ), Douglas fir (Pseudotsuga menziesii), and oaks (Quercus spp. 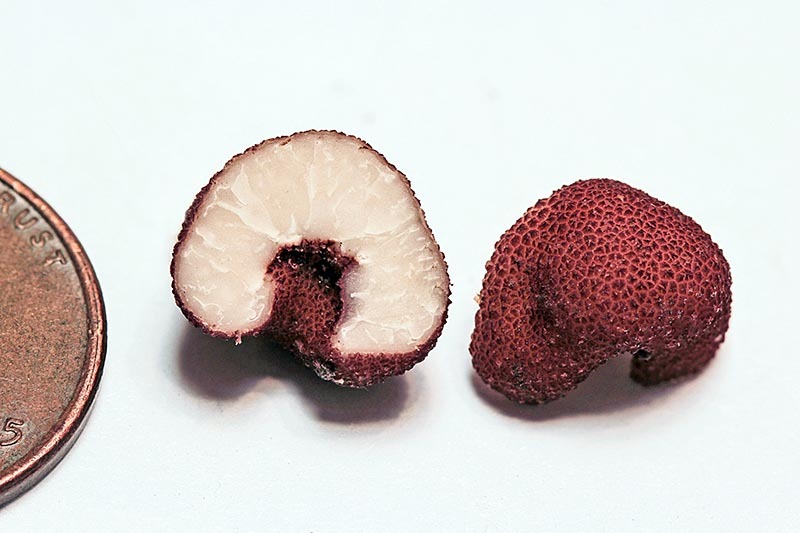 ); widely distributed, found along the coast and low to middle elevations of the Sierra Nevada; fruiting throughout the mushroom season; occasional. Balsamia magnata forms small reddish brown, warted, subglobose ascocarps, the peridium typically infolded at the apex, creating an opening or cavity into the gleba. 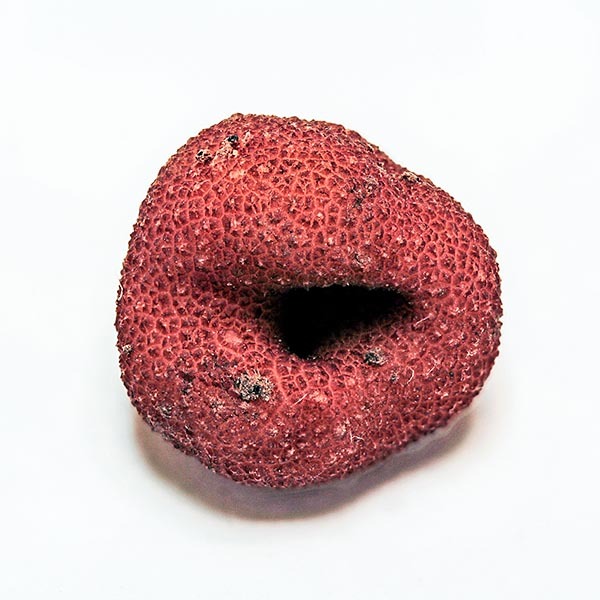 The gleba itself resembles that of some Tuber spp, i.e. marbled and solid, but differs with canals and veins that radiate from the apical region. A close relative, Balsmia nigrans has a blackish warted peridium but is otherwise similar including mycorrhizal hosts: pine, oaks, and Douglas fir. Like B. magnata it lacks a strong odor or taste. Similar to Balsamia magnata is Pachyphlodes carneus (= Pachyphloeus carneus) a species complex whose members macroscopically resembles Balsamia magnata although usually more orange and with a less infolded ascocarp. 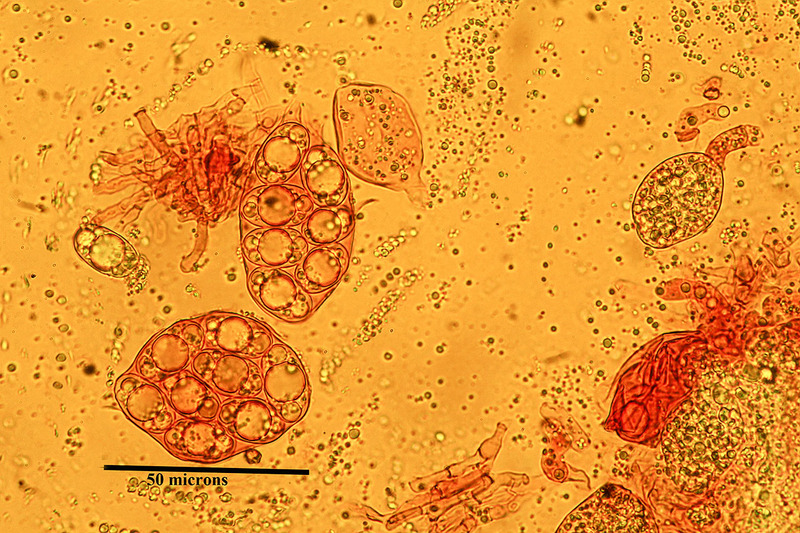 Microscopically it is distinguished at maturity by brown, globose, spiny spores. 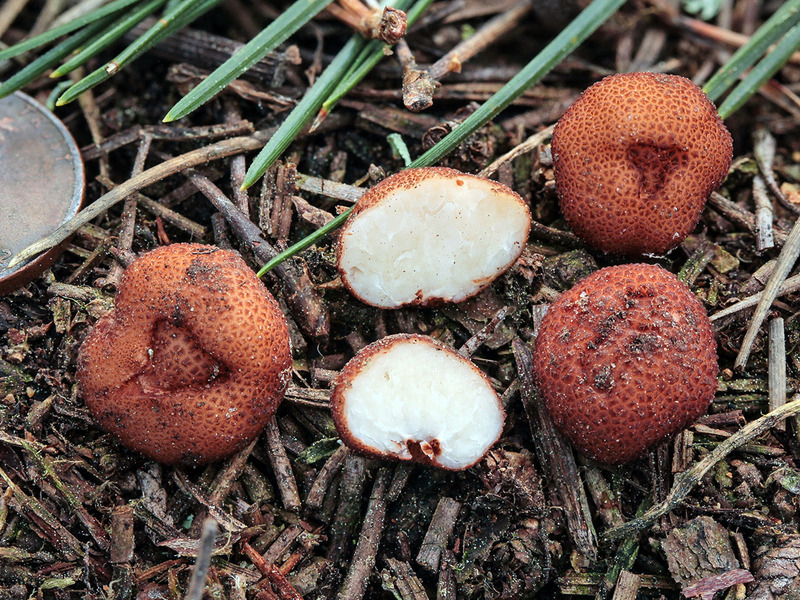 Also similar is Barssia oregonensis, a Douglas fir associate common in the Pacific Northwest with a distribution that extends into northern California. It also has an infolded ascocarp, but the peridium is buff brown to light brown, sometimes tinged pinkish, the surface bumpy to minutely, not strongly warted. Microscopically the spores are similar though usually larger and the asci are arranged in a palisade rather than scattered in the gleba. Beug, M.W., Bessette, A.E. & Bessette, A.R. (2014). Ascomycete Fungi of North America. University of Texas Press: Austin, TX. 488 p.
Gilkey, H.M. (1916). A revision of the Tuberales of California. Universtiy of California Publications in Botany 6: 275-356. Gilkey, H.M. (1939). Tuberales of North America. Oregon State College: Corvallis, OR. 63 p.
Southworth, D., Frank, J.L., Castellano, M.A., Smith, M.E. & Trappe, J.M. (2018). Balsamia (Sequestrate Helvellaceae, Ascomycota) in western North America. Fungal Systematics and Evolution 2: 11-16.